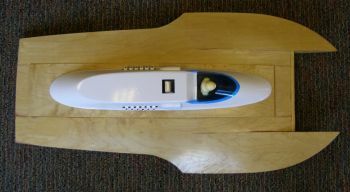 Now enlarged to 30 inches long, the Blaster-30 is a laser-cut kit with all wood parts necessary to complete a full hull, including skins and hatch. Also included is an ABS cowl - with side scoops and cutouts for intake and exhausts - and Tail Feathers. Resin cast parts include driver, exhaust stacks, and engine scoop. Below are some parts that can be used. This is not a kit, just recommended items. Motor, Leopard 3650 1650kv, 1840kv or 2090kv. The higher the rpm, the lower the runtime. Either 1/8 to .150 or 5mm to .150, depending on Motor shaft used.